Waiting is not my forte. Can you relate? As I’ve been thinking about all this, I returned to one of my favorite waiting passages: Psalm 37. Tucked within David’s profound words are tips to help you wait without going wiggy. I’m guessing you need these tips as much as I need them. I pray they bless and encourage your impatient heart as they have mine. 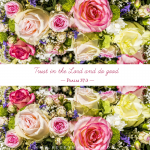 Trust in the Lord and do good; dwell in the land and enjoy safe pasture (Psalm 37:3). How do you do this? Make deposits in your faith account. One practical way to do this is to choose one Scripture to center your mind on while you’re waiting. Shift your focus from waiting and the anxiety of not knowing to the words of the verse and the truth it teaches. Similarly, another way to build your trust account is to praise God for His character while you wait. The next time the drive-thru is backed up at Starbucks and you’re in a hurry, shift your focus to praising God for His character traits. All of a sudden, you’ll realize it’s your turn! You’ve become so consumed with Jesus that you didn’t even realized the line was moving. Take delight in the Lord, and he will give you the desires of your heart (Psalm 37:4). You might not be reading Scripture or singing a hymn, but maybe you look out the window and catch the beauty of a sunset, or you take a walk and drink in the beauty of the flowers, or you simply sit in silence and tell God how much you love Him. As you slow down and practice pausing to breathe, you’ll become more aware of God’s presence. So often it’s our hurry that keeps us from enjoying the presence of Christ. At times I pray something like this: Lord Jesus, I sense your presence here with me; rather than speeding up this moment, I want time to stand still so I can enjoy this moment a little longer. Teach me to pause throughout this day to simply enjoy You! Write out your prayers and let go of your worries (Psalm 37:5). Commit your way to the Lord; trust in him and he will do this (Psalm 37:5). I don’t know about you, but sometimes I have a million worries. My worries are amplified when I am waiting. In those moments, when I feel pummeled by worry, I stop. I write out my prayers and give over every worry to the Lord. By writing my prayers out, I have tangible evidence that I’ve given that worry or concern to Jesus. He is more than able to handle every concern in my heart. He will take the burden that’s crushing me and begin to work in ways that I can’t even see as I commit it to Him. When the worry threatens again, I open my journal and see the prayer I’ve written; I remind myself that I’ve already given that concern to Jesus, and He is already working on that situation. Then my heart finds rest. Friend, the truth is that waiting is likely never to get easier, but I believe we can wait without going completely wiggy! I am enjoying the beauty of Colorado Springs, home, and family right now. Steve and I are waiting to hear about a book proposal we’ve submitted. We’ll see what God has in store. This would be our first time writing together as a couple. The video series for, Who Do You Say That I Am? is almost complete. I am in the process of writing the listener’s guide. Please pray as I finish and prepare to launch this project. The completed video series will be available August 7. Please pray that many churches and small groups will order the material and that they will have a life changing encounter with Jesus Christ – it’s all about Him!